Shortly after 09:00am today the guesthouse of resistance in Meuchefitz (Wendland/ county of Lüchow-Dannenberg) was entered with a search warrant. The search warrant was issued on the second of February and was targetted against one accused. A group of one hundred masked cops with machine guns confiscated a banner that was hanging at the front of the building. You will find the German version of this article: here. 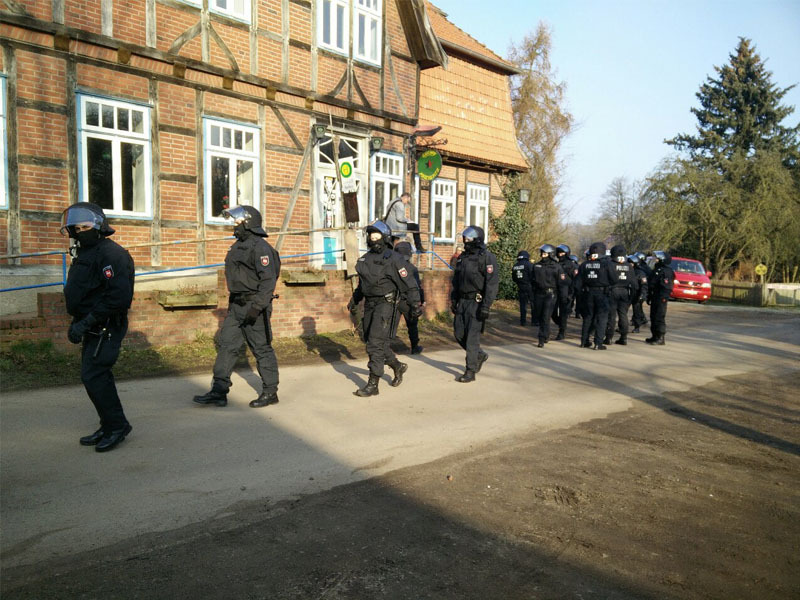 Shortly after 09:00am today the guesthouse of resistance in Meuchefitz (Wendland/ county of Lüchow-Dannenberg) was entered with a search warrant. The search warrant was issued on the second of February and was targetted against one accused. A group of one hundred masked cops with machine guns confiscated a banner that was hanging at the front of the building. On the banner with the title: “Afrin hang on!” was written “Turkish troops and German arms kill in Rojava! Long live the YPJ/YPG!”. The names of both militias were underlayed with red, yellow and green. All guests that were present had to give their personal information to the cops, among them one family with children. A neighbouring caravan site was completely surrounded and for a short period of time the residents of the caravans were not allowed to leave the site. The license plates of all cars that were parked were listed by the state security (Staatschutz, a police unit for political “crimes”). In the search warrant the German state bring forward the argument that the PYD (Democratic Union Party), of which the YPG /People’s Defense Units) and the YPJ (Women’s Defense Units) are the military arm, is a “depending subsidiary organization” of the banned PKK and because of that the YPG are part of the ban. Demonstrations of the Kurdish umbrella organization NAV-DEM were recently banned with similar arguments. The people who registered the demonstrations were being told NAV-DEM is a follow-up organization of the PKK, which is banned in Germany. Until now a new decreet of the interior ministry is not avaible, let alone a court order. Todays show of force in the county aligns with the events of the past weeks: Regularly passage of cops through Meuchefitz and attempts to put pressure on people to divide the resistance. At the 27th of January people protested in Lüchow against the Turkish attack against Afrin, shortly after that a resistance committee was founded. Long live the YPG/YPJ! Come to the demo today (February 20) at 05:00pm (17:00) at Marktplatz in Lüchow! Hausdurchsuchung im #Wendland wegen #YPG #YPJ Transpi – Enough is Enough! #Germany Spontaneous Demo After Cops Raided Guesthouse of Resistance in #Wendland Because of #YPJ / #YPG Banner – Enough is Enough! Protests in Solidarity with #Afrin Again Banned in #Germany – German Government Approves 31 Arms Deal with Turkish Army – Enough is Enough! Sakine Cansız, Fidan Doğan and Leyla Şaylemez: Killed in #Paris, Banned in #Hannover #Germany – Enough is Enough!